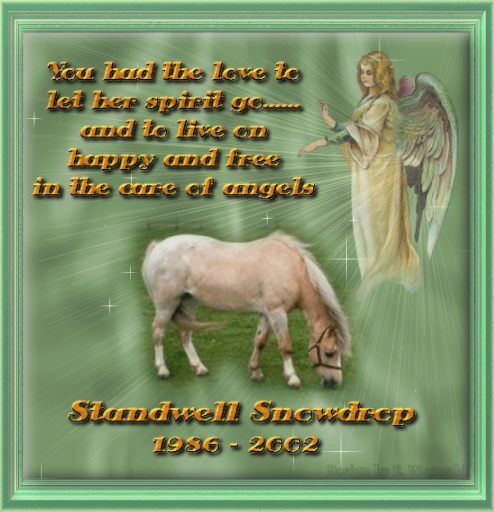 23/04/02 Sad day here at Runshaw, after being diagnosed with a Cancerous Ovary our beautiful Palomino mare Standwell Snowdrop (full sister to Standwell Selina) was put to sleep, nothing could be done for her and at 18 years old we felt was too old to start messing about with, she will be very sadly missed but at least she is no longer suffering. We've been to Alan Roberts today in Nottingham, the lovely chap who sold us the gorgeous mare Standwell Selina and came back with the stunning black mare Standwell Black Fashion!!! Details now on the mares page but basically she is by Coed Coch Reg and out of Standwell Heidie's full sister Standwell Super Fashion and boy can this mare move!! Crossways Betty our lovely chestnut roan mare has been covered by Churtoncroft Aries again, hopefully she will produce a foal for us next year fingers crossed as it should be a stunning foal!! Standwell Black Fashion has been covered by the superb chocolate Dun stallion Coed Coch Atebiad hence doubling up on the superb Royal Welsh Agricultural Society winning mare Coed Coch Ateb . The Collier family came to view our gorgeous 4 year old Stallion Friars Welsh Punch as a prospective Wembley Working Hunter pony as we had made the huge decision to part with him as he was finding stud life increasingly difficult to cope with and was thoroughly enjoying the starting of his ridden education. They fell in love with him and bought him there and then so he is to be gelded and to become Emmie's ridden pony, we wish them the best of luck although i don't think they will be needing any!! North Western Welsh Pony and Cob Association show, Churtoncroft Aries forward and stood 2nd in the Stallion Class, judge was Mr Wilson, Cwmnantgwyn Stud.The superb 3 year old colt from the Arvon stud, called Arvon Trysor from North Wales was Section A champion and this stunning colts Medal was greatly deserved!! Keep a look out for this chap, he's a stunner! Our beautiful mare Standwell Heidie has also been covered by Coed Coch Atebiad and is hopefully going to produce another foal the calibre of Runshaw Hafog, the bay colt we have retained from this previous mating from last year!! Friars Welsh Punch gelded ready to embark on his ridden career, any second thoughts i may previously have had are useless as there's no backing out now!!! Standwell Selina our Palomino mare has been covered by the Dun stallion Coed Coch Atebiad , a very exciting cross of bloodlines and eagerly awaited!! Thistledown Walnut and Penwisg Helen are now back at home ready to be covered, Walnut again to Coed Coch Atebiad after the stunning dun filly she produced last year to him and Helen to be covered by Churtoncroft Aries for the hope of a palomino foal. Runshaw Calonnog is to join Friars Welsh Punch at Pauline, Claire and Emmie Colliers, what better place for him to go as a prospective ridden pony!!!! We feel this colt has a huge future in the ridden ring ahead of him and is now to make that first step towards a hopefully superb future. Runshaw Calonnog and Friars Welsh Punch were delivered today to the beautiful Staffordshire countryside to the Colliers. Both settled in well and seemed very happy in their new home. We wish them all the success in the world with these 2 beautiful boys. Thank you Pauline and Claire for making us feel so welcome , giving our boys such a lovely home and showing us your beautiful ponies, quite partial to Claires simply stunning Black Welsh Cob though!!!!! Also good news is Standwell Black Fashion doesn't seem to have returned after her covering with Coed Coch Atebiad, so fingers crosed!! She was due in today but doesn't seem interested so hopefully we'll have some more Atebiad foals!! Standwell Heidie is due in season on Monday if she is going to return so fingers crossed, Crossways Betty doesn't seem to have returned either on Sunday so fingers crossed but we have been down this road before!!! Well Fashion had us fooled and has come back in season so we have now covered her with our young up and coming colt Fosterhouses Super Sam and hoping to breed another Standwell Heidie!! Fingers crossed for this time!! Penwisg Helen has been covered today by Churtoncroft Aries, with him being Chestnut with a Flaxen mane and Tail and Helen Dark Dun i wonder if we'll have a Palomino again!! Thistledown Walnut has returned in season to Coed Coch Atebiad so we have covered her again with him, fingers crossed this time!! Well she's done it again!! Crossways Betty has returned in season so is to be covered by Churtoncroft Aries again, the little madam!! Also today we go and collect our mare that is coming here on lease from Pat and Cyril Pinnington of the Churtoncroft Stud. Nantdywyll Modlen is a double grandaughter of Coed Coch Bari and is 100% Coed Coch bred. She is a lovely old mare and we feel very privilaged that the Pinningtons think enough of us to allow us to have this lovely mare from them. Great Eccleston Agricultural Show, Boss (Churtoncroft Aries) out for a pre Royal Welsh spin , he behaved superbly in a mixed class , went well and came home with a 3rd!! Royal Welsh here we come!!!! Well we arrived at the Royal Welsh in good time with no problems on the journey. Churtoncroft Aries and Runshaw Hafog settled into their stables and then it was time to party!! Bed at 2.30 am and up at 5am!! Nerves getting to me a little and also the fact that the animal behind Boss's stable was a in season cob mare!! But never mind we went into the class in the afternoon and stood 5th in a very good class of senior stallions!!!! Absolutely thrilled to bits!! Today is Hafog's turn, he was very naughty yesterday with all the excitement but lets hope he behaves. Well he didn't let me down and was an absolute angel! He went so well that we were retained in the ring for judging which was more than good enough for me!!!! We had a lot of admiring looks from some very big studs and hopefully they are thinking the same as me, he needs time but will he be worth it!! Tired but ecstatic!! To anyone who hasn't been to the Royal Welsh the entrants come into the ring and have their first run out in front of the grandstand and then are told if they are to go on the front row or the back. The front row is retained in the ring for judging and the back are asked to leave. So as you can see to be kept in the ring is quite an achievement and like us is enough of an achievement at the Royal Welsh Show!! Royal Lancashire Show, Churtoncroft Aries was 2nd in the Stallion Class, he went like a train again and thoroughly enjoyed himself! Very pleased with him. Covered Modlon with Coed Coch Barnwr. We are not sure if Barnwr is still fertile or not but as Modlon is such a fertile mare it is worth a try. Runshaw Ap Sior went to his new home today in the South of England to the Birchcourt stud. We wish Dan and Sue all the very best with this lovely young colt. But i'm sure with his type, breeding and action he'll do them proud both in and out of the showring! Coed Coch Feature Day organised by the Clwyd Association for the Centenary Celebrations. Well what a fantastic day we had at Coed Coch! Thanks must go to all involved in making this day so significant and to Wyn Jones (Nerwyn) for thanking us for coming. It was all very well thought out and with a super catalogue to say who was who and owned/bred by who. The old pictures that were on show where gorgeous, lots of previously unseen ones and lots of old faithfuls, you could get yourself lost in the superb photo albums on show, by the way Wyn what happened to all the photocopied pictures that were on the wall? I could think of a lovely home for them if they are currently homeless!!! We had some gorgeous pictures taken by Pleasure Prints while we were there including some taken of the boys in front of the house on the brow of the hill and surrounded by trees, real steps back in time and i seemed to start a trend then! We took the mares Standwell Selina,Penwisg Helen and Thistledown Walnut who all paraded and i believe S4C are doing an hour long documentary of the Coed Coch including todays open day and it is to be aired on 14th August which includes interviews with all of us with the Coed Coch ponies! A huge thank you to everyone once again on a superb and very memorable day. All our mares and fillies except Crossways Betty , Bi Bridge Party Girl and Nantdywyll Modlen have now been turned out for the rest of the summer today, they look lovely running together as a herd until you realise that we now have 18 females in the stud, i really must reduce numbers as some are simply being wasted! Please see sales page for details of ponies available, all for sale due to no faults of their own, just my overstocking! North Western Association of the Welsh Pony and Cob Society Summer Silver Medal Show, Wythenshawe Park, Manchester. Judge Miss J Sheil, Dukeshill Stud. Boss (Churtoncroft Aries) 1st in the Senior Stallion Class, Champion Section A, Idyllic Lady in Red exhibited by the Wallers, Delami Stud, reserve Lacy Trydar exhibited by P.Hancox, Auric Stud. Superb show with fantastic entries forward and some stunning ponies there, in particular the Senior Broodmare Gartconnel Starlight Express and her filly foal by Gartconnel Shooting Star, absolutely stunning!!! I could have quite easily put them both on the wagon and Boss took quite a shine to the mare too!!! It was so nice to see good moving, scopey ponies being placed at the top of the line, quality was in abundance and it was super day out! 19/08/02 Well Abbey (Crossways Betty) has returned in season. We had her swabbed and flushed out after seeing some discharge but it now seems she could have slipped her foal earlier (hence discharge) as all her results came back fine. She was scanned last week but no foal but more importantly no scarring or anything nasty so no reason why she can't have another foal. So she came in season today and is covered by Boss (Churtoncroft Aries) again. Nantdywyll Modlen has returned to Coed Coch Barnwr, but we did expect it really, so she has been covered by Penwisg Sior. Both late foals if they happen , but both better late than never if they produce and both to be retained anyway so not a problem. Bowlee Welsh Medal Show, Boss was 2nd in the Stallion class to Sunwillow Zermatt. Section A Champion was Penwisg Pin Up Girl, reserve Foxgate Eedi. 01/09/02 Worsley Gala Welsh Medal Show,Aspull, Wigan. Section A and B judge was Meirion Davies. Runshaw Ap Sior has his first outing today too and had a superb day too!! Stars must have been right today for the Runshaw stud. He won the Open Welsh class and then won the Small breeds M&M youngstock class and then was M&M champion from 9 classes including the Ridden. So not bad for a yearling on his first outing and he won himself a sash too!!! Well done Dragon and his faithful servant Dan, can't believe we sold the one who wins the sashes!!!! LOL! Well Runshaw Andreas and Runshaw Cariadog have both set off on their way to their new home in Edinburgh as future show and stud stallions. We wish the Dunedin Stud a huge amount of success with the boys, but i want to win the sash first!!!! 06/10/02 Churtoncroft Pryd had his first outing this year and went to Garstang Horse Show were he won the open youngstock class and was 6th in the open pure bred welsh, which his father Churtoncroft Aries won, he was superbly behaved (although a bit vocal!!) and came home a very tired boy after all the excitement! 28/10/02 Well not a lot to report lately really but good news is today Bi Bridge Party Girl has found a new home with the Crabbiesden Stud in Scotland. She goes to join Roma's beautiful Cobs at the end of November. We wish Roma all the luck in the world with this beautiful filly, and what a superbly bred filly to have as your first Section A!!!! 17/11/02 .Lancashire Welsh Pony and Cob Association Mountain and Moorland Championship Show. Ponies entered are Churtoncroft Pryd, Nerwyn Lleban and Runshaw Hafog. No longer going to confirmed cases of Strangles within 10 miles of us, we feel its not worth the risk! While looking at the mares today Standwell Selina looks very much in foal to Coed Coch Atebiad, fingers crossed as this is a very exciting foal indeed! Standwell Heidie also looks in foal to Atebiad, Standwell Black Fashion also looks in foal to Fosterhouses SuperSam and Penwisg Helen looks in foal to Churtoncroft Aries, i have doubts about Thistledown Walnut being in foal to Atebiad though, time will tell. At home gut feelings tell us Crossways Betty is in foal but we've done this before! and Nantdywyll Modlen hasn't returned to Penwisg Sior, so fingers crossed! Also starting planning next years matings too, the only ones we have decided on are Chetwynd Lily to be covered by Churtoncroft Aries and Lacy Primula to be covered by either Aries or Penwisg Sior, other thanthat i have no idea as of yet!! Anyway looking forward to Christmas in 6 weeks time and wishing my life away now waiting for these foals to be born in spring. 17/11/02 We are pleased to announce that the fantastic moving mare "Lowden Seren Y Nos" is to come and join us in spring! She is by Aston Galaxy and out of Coed Coch Rhamant and we have high hopes for her, Thanks are sent out to Sal of the Amilas Stud for finding her and to Sharon Scott of the Norash Stud for allowing us to have her. Her details are now on the web site. 16/12/02 Well we couldn't wait that long and went to collect Lowden Seren Y Nos and Amilas Iona today from Salima Keswani of the Amilas Stud , Buckinghamshire!! After terrible traffic around Birmingham we finally arrived with Fosterhouses Ula who is now owned by Salima and who we wish all the best of luck with, she is a lovely young mare who wil suit Sal's breeding program to a T! After we unloaded F.Ula (aka TJ) we were then treated to sandwiches and Coffee before going to collect the 2 mares to come home, what an absolute credit they are to their breeders as both were caught and loaded onto a strange wagon in the Moonlight without any problems at all. Thanks again Sal for allowing us to bring back two absolute beauties to the North of England! Pictures of these 2 new additions will be updated onto the web site on Sunday, don't forget to have a look at them!! 27/12/02 We have collected Nerwyn Lleban and Runshaw Hafog for a week while their "adoptive Mum" goes away for the New Year. Its lovely to have Sox (R.Hafog) home he's a gorgeous chap and i have great hopes for the future with him! Hopefully taking some pics today so i can update his page with new pics. Cloud (N.Lleban) is maturing into quite a handsome chap indeed and is still an extremely extravagant mover, he'll hopefully be licensed and have his first couple of mares this coming spring.